y name is Lisa. I live in Cheshire UK. I’ll tell you a bit about myself -well the foodie bits anyway. I grew up eating a healthy but standard UK diet, meat, veg etc. but Mum did make her own museli (rabbit food as I saw it) and was always sprouting seeds (weird – no one else’s mother did that!). At around 15 I became aware that I wasn’t happy eating this way, combined with a comment about my increasing weight, spurred me to cut out the foods I was uncomfortable with,, leaving me eating fruit and veg, and caught up in an eating disorder. I knew I needed to change my diet, but lacked the knowledge to do so in a healthy way, which left me ill and depressed. At 18 I left home for University – leaving meat behind. I still ate fish, in order to convince my mother that my eating disorder was history. Years passed like this, still feeling uncomfortable with what I was eating, but not knowing where to look. Life was difficult, getting up in the morning was daunting – my first thoughts being, ‘Oh God it’s another day.’ My head was foggy, I had no energy, I hated my body, I was feeling pretty miserable about life in general and beating myself up for feeling like this as I had so much to live for, not least two beautiful children. Then in the summer of 2006 I decided to take action. The macrobiotic diet was promoted by Gwynneth Paltrow, who looked fabulous. I went to the book store to find out more about macrobiotics. No joy. But what I did find was Kate Wood’s Eat Smart, Eat Raw. Flicking through it I realised the recipes contained all the foods I loved, and on reflection, discovered that the times I had been happiest in recent years had been when I had been eating high raw without even knowing what ‘raw’ was!!! I’d always loved food preparation, so this was a new and exciting extension for me. Over the next 18 months I cut more and more cooked food from my diet, researched extensively and attended raw workshops run by the amazingly inspirational Karen Knowler. In December 2007, I attende a retreat run by Karen – ‘Your Best Raw Self 2008′. At this point I felt as if I’d hit rock bottom. I’d had a bad 18 months both at home and at work. Things had been said to me which left my spirit crushed, depressed and surrounded by feelings of worthlessness. Rather than tackling these issues I dealt with them by binge eating and drinking to numb my emotions. I signed up to the retreat to help me break from this destructive cycle and to learn to feel calm, confident and most improtantly good about myself – full of life, love energy and radiance. From Karen’s coaching model it became clear that although I had mastered the delicious food, I lacked support ( my husband was extremely anti to say the least – but that’s another story) and lacked clear vision of where and who I wanted to be. I started going to monthly potlucks where I discovered to my surprise that people raved about my food (rather than turning their noses up as they did at home!) I attended as many workshops as I could and ended up helping at workshops and preparing recipes for them! I felt alive, energised truly me when I was in a raw environment. I knew this had to be the right path for me. My passion for raw was growing rapidly. I trained as an Alissa Cohen instructor. I joined online programmes and discovered that not only was this where my passion lay, but that I had more knowledge and experience that I realised, and that I could share this, and people wanted to listen!! Other shifts started happening, not just around food. I discovered breathwork, rebirthing, crystals, journalling, buddhism – wow, had someone said this to me 12 months ago I’d have thought they’d gone gaga! I took a big step and finally left the job that was surrounding me with negativity, and felt as if a huge weight had been lifted…. Towards the end of 2008, another shift happened – I decided that I’m no longer prepared to compromise myself and hold myself back from being the person I want to be just to fit in with the views/opinions of others. I decided I needed to draw on my inner strength, to go out into the world being true to myself, living the life I know is best for me, physically, mentally, emotionally and spiritually. This realisation made me feel alive, relieved, as if I’d set myself free. I’ve discovered clarity about who I want to be, who I am now allowing myself to be. I’m finding calmness and inner peace. I’ve found a passion for life which I can’t ever remember feeling before. This journey has been about so much more than one about food. 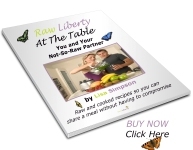 Initially this was a personal journey, but now I feel compelled to share it with others – to show that eating raw doesn’t mean just eating carrot sticks and lettuce, that it is achievable even if the rest of your family is ‘cooked’. The most important lesson is to be true to yourself.